The USB 3.0 card has more bandwidth than we could possibly hope to make use of, not to mention it costs surprisingly little next to the idea of purchasing four separate controllers. Considering just how many USB 3.0 devices I’ve found myself reviewing of late, there’s a few lessons that I’ve picked up on worth sharing. First off, never under any circumstances limit a USB Controller to PCI Express 1.0 x1 bandwidth (250MBps). With Gen1 slots, I’ve seen file transfers hit walls of 90MBps during write tests that were only ever alleviated by switching over to a PCIe 2.0 x1 slot (500MBps). USB 3.0 is rated for 640MBps (5Gbit/s) anyway plus the controllers are usually connected natively by PCIe 2.0 x1, so it makes no sense to limit yourself. Second, you can never have enough USB 3.0 ports. This should go without saying. More and more hard drives are being released that take advantage of the new platform, and that number will skyrocket once Intel releases chipsets that feature native USB 3.0 come April 2012. Of course, as more USB 3.0 devices are added to a system, it becomes ever easier to run out of USB 3.0 bandwidth since there’s only 500MBps to pass around. Two solid state drives will tear through that easily. Third, my motherboard can be a cruel joke. All of my PCIe x1 slots are verison 1.0 and therefore unsuitable for USB 3.0, and if I make use of my only free PCIe 2.0 slot, my onboard USB 3.0 gets throttled down to PCIe 1.0 speeds. If I’m to install any USB 3.0 expansion card that actually earns me a net gain of controllers suitable for benchmarking or serious storage, the card must have multiple USB 3.0 controllers. 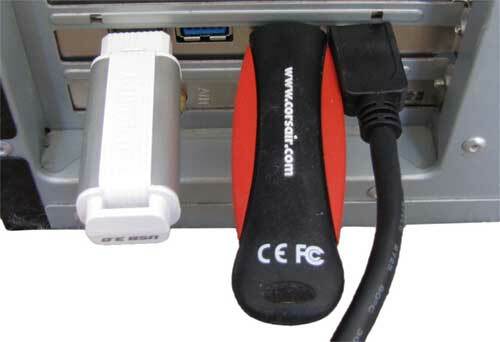 Since each USB controller would make full use of a PCI Express Lane on its own, the card also needs to have a PCI Express x4 interface or better lest the controllers be choked for bandwidth. 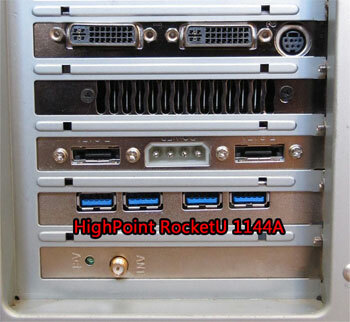 Enter HighPoint’s RocketU 1144A 4-port USB 3.0 card, to date one of the only two cards to feature multiple USB 3.0 controllers, the other being HighPoint’s RocketU 1142A that sacrifices two external ports for a 20-pin internal front panel connector. And what a beast this card is! The 1144A features no less than four ASMedia ASM1042U controllers, one per port for maximum performance. The interface? PCI Express 2.0 x4. Now this is more like it. Installing the RocketU 1144A couldn’t be more straightforward. Power off the PC, slap the card into a spare PCIe x4/x8/x16 slot, power the machine back on and then install the latest drivers from HighPoint’s website. There’s no configuration required, and no need for an extra power connector like there is with several other cards. That latter point could pose a problem if you’re connecting several power-hungry devices, but the externally-powered hard drives and NAS enclosures the 1144A is targeting won’t be an issue. To get into the nitty gritty of the card’s design, each of the the four ASM1042 controllers are interfaced over their native PCIe 2.0 x1 interfaces to a PEX 8609 PCIe switch from PLX Technology. The great thing about this switch is that it’s meant to handle twice as much traffic as these controllers are feeding it with only 140ns latency, so there’s no bottleneck to be found. 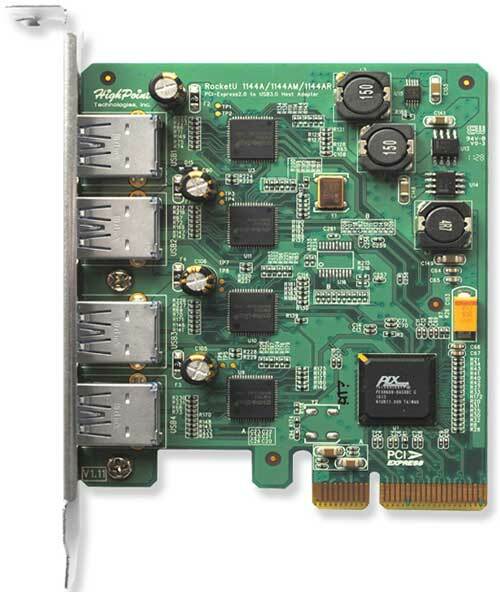 From there, traffic is passed onto the PCIe 2.0 x4 interface of the card, rated at 2000MBps or 15Gbps. In other words, HighPoint is essentially providing end to end connectivity to each of the four controllers at their native speed, so the only limits to performance are your drives or the USB controllers themselves! In case you’re left scratching your head at the 15Gbps limit of four PCIe x1 interfaces vs the 20Gbps limit that four 5Gbit/s USB controllers would suggest, well, that’s marketing for you. As I’m sure you can imagine, testing such an extraordinary amount of potential bandwidth can be rather difficult without an unlimited budget to buy out Micro Center’s stock of USB 3.0 NAS enclosures at $1360 a piece, so the best I can offer is this collection of screenshots showing four different instances of HD Tune performing simultaneous benchmarks on the fastest USB 3.0 devices at my disposal. These include the Seagate GoFlex Desk 4TB, the Samsung STORY Station 2TB and a pair of Corsair Flash Voyager GT USB 3.0 drives. As you can see, the performance is hardly varied from when I first reviewed them, but this is all happening simultaneously! What’s more, I still have plenty of CPU to spare on my four year old Core 2 Duo! Either I’m too easily impressed, or HighPoint is worthy of high praise. When this review was first published on February 18th, I had been experiencing a couple of severe incompatibility issues with the RocketU 1144A USB 3.0 card and two devices that offered more than USB Mass Storage capabilities. Given the general lack of non-storage USB 3.0 devices that are currently available for sale and by extension my own testing, I incorrectly concluded that the ASMedia ASM1042U controllers powering this card were incompatibile with non-storage devices which otherwise worked fine with competing USB 3.0 controllers. One of these two devices – Targus USB 3.0 video adapter – recently received a firmware update from the manufacturer and is now playing nicely with the RocketU card, all without me running any updates to the ASMedia drivers or firmware. Not only does this invalidate my theory, it invalidates my original conclusion for the review, so please accept my apologies for the confusion I’ve wrongfully caused. The remainder of the review has been updated to reflect only my findings that are still current. 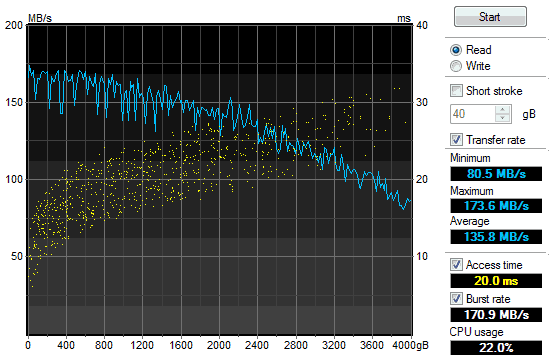 The RocketU 1144A does have a few minor issues that I take fault with, but thankfully they’re all incredibly minor. Given the outstanding performance this card is able to achieve, not to mention the obvious benefit of having it all fit into a single expansion slot for little more than the cost of purchasing four separate USB 3.0 controllers on their own or the notable lack of any alternative expansion cards that do the same, I personally would find it foolish to weigh these into a final purchasing decision. Nevertheless, I figured I’d share these issues just the same in order keep your expectations on the level. First up is the relatively narrow spacing between USB ports on the back of the card that will interfere with many flash drives. As you can see in the below photo, a USB cable needs to be plugged in at a stressed angle next to a Corsair drive, and it’s practically impossible to plug two flash drives next to each other. Thankfully this is easily mitigated with a couple of $3 extension cables. The second minor issue I have is that the card does not appear to have BIOS support for bootable devices. To be honest, however, I’m never comfortable booting from anything that doesn’t have an Intel logo or isn’t attached to my directly to my motherboard, if only for the peace of mind that Chipzilla’s extensive testing brings to the table. Booting from an eSATA device would offer better performance anyway given that USB has zero support for Native Command Queuing (NCQ). 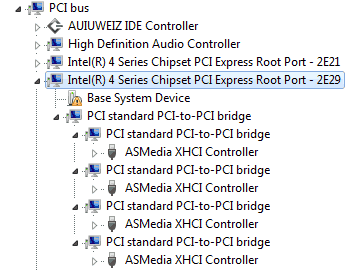 There’s also the matter with the driver installation package in Windows and how it omits the driver for a “Base System Device” that points to the card’s PCI Express switch. This has absolutely no negative impact whatsoever on the card’s operations; the OCD side of my persona is simply annoyed by having a yellow exclamation mark appear any time I open the device manager. Lastly, I take issue with the idea that Apple users have to buy a separate, more expensive SKU of what looks to be the same card, the RocketU Quad USB 3.0 for Mac. Granted, the Macintosh version comes with its own software RAID solution, but that’s hardly worthy of a $30-$36 premium in my opinion. It’s possible that the Macintosh drivers offered for download may very well work with the PC variant of the 1144A, but alas I don’t own a Mac Pro to test this theory. It’s hard to argue that average users have need for any more than a single USB 3.0 host controller in their PC once you consider that they’re likely to only have one or two hard drives connected at any point in time. That said, there no doubt exists a sizable niche of professionals and enthusiasts who crave more bandwidth than current 500MB/s implementations can offer. HighPoint caters to this niche very well with the RocketU 1144A expansion card, providing end-to-end bandwidth for each of its four controllers in such a way that there are zero bottlenecks. Better still, the appeal of having four xHCI controllers consolidated to a single expansion card is absolutely priceless for anyone looking to make the most out of their limited PCIe slots. At a mere $90 the RocketU makes a rather compelling case against purchasing four separate controllers for $20 each and comes highly recommended.